Vicki sings a song – “When God Has Another Plan” that she said absolutely describes what went on this past weekend. She even told me Saturday night driving home, no matter what, when God has another plan, it is always best. Let me explain. We planned to go spend some time with Candice and the kids, watch Trae play on Saturday, then come home on Saturday evening. But then it started on Thursday. We got a call that Vicki’s dad (Bob) was being put in the hospital in Enid for some tests on his heart to find some answers. Then I got a call about 3:30 Friday morning that Mom was in distress. Her oxygen was in the 70’s, she was turning blue and she wasn’t breathing well. Kathy went to be with her. After Vicki got off on Friday, we were trying to decide whether to go to Norman or to Enid/Wakita. Kathy called and said that Mom’s oxygen was running at 97, she was eating and talking. Vicki’s mom told us not to come to Enid if we weren’t going on to Wakita. So we headed for Norman. We had just pulled into Norman when we got the call that they were moving Bob to the Heart Hospital in OKC. We met Candice and talked with her then headed to the Heart Hospital to see what was going on. We got there when they were getting Bob settled. The doctor wouldn’t be in until Saturday to let us know the plan. So we went on to Candice’s. They still didn’t know anything by early morning so we decided to go on to the game. We got there to meet Vicki’s sister, Gina and her husband Daniel and daughter Hannah. We got Timothy checked in but Gina was on the phone. She got off and said that Vicki’s brother, Alan, had been rushed to a hospital in Tulsa with a heart attack. Vicki and Gina took off for Tulsa to be with Alan. Alan had a heart cath and they put in a stent. They also said that he had further heart damage because he didn’t come in when he had the heart attack on Thursday. Right now he is stable but will possibly have some bypasses in the near future. We went to Norman to watch a basketball game and ended up with Bob in OKC and Alan in Tulsa both with heart issues. We never planned on things like that, but ‘when God has another plan’ you go with Him. Bob will have double by-pass surgery plus repair a valve on Tuesday. Alan will probably be out of the hospital by that time, but will still be facing issues with his heart. But both her dad and brother are alive. God blessed even when we didn’t know what all was going on. In Jeremiah 29 tells us the message to the exiles. He told them what they needed to do and the direction they needed to take. God promised He would take care of them. 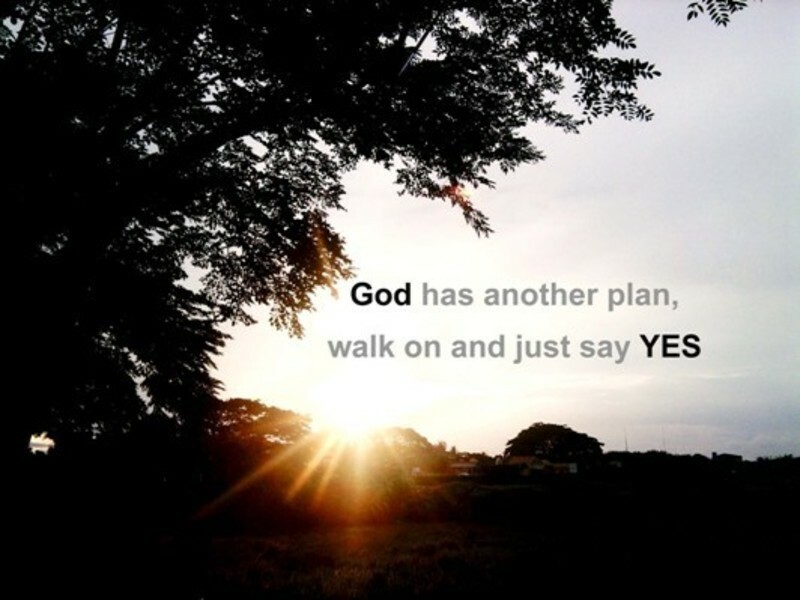 But it was in Jeremiah 29:11-13 that He spoke of His plans --- 11 For I know the plans that I have for you,’ declares the Lord, ‘plans for welfare and not for calamity to give you a future and a hope. 12 Then you will call upon Me and come and pray to Me, and I will listen to you. 13 You will seek Me and find Me when you search for Me with all your heart. We sought God in prayer time after time this past weekend and God was there. We don’t know what the end of this story will be at this point, but we do know that ‘when God has another plan’ you go with Him. You trust and follow each step of the way.